Is this factual? Is it not the reverse that is true - that it is rainfall that attracts trees? Well the reverse is certainly true, but there are theories explaining why forests and rainforest attract rain. It has something to do with the excess moisture shed by trees which condenses with the existing moisture in the atmosphere to form clouds and eventually rain etc. But, not sure by planting a gazillion trees one could create a man made rain forest. Which is what I think you are saying. ???? Dunno. I would completely agree with you, certainly we can't create man made rainforest. But by planting large number of trees we can certainly create forests or at least increase the area under tree cover. Peru’s glaciers have made it a laboratory for adapting to climate change. It’s not going well. After a day of bright sunshine, a chunk of ice the size of a dump truck broke off the glacier on Mount Pucaranra a few weeks ago. It plunged into the lake below and kicked up a wave nine feet high. Victor Morales, a small, catlike man with a tattered ski cap who is the lake’s solitary watchman, scrambled up to a stone hut on the side of the mountain and got on the radio. The wave had damaged an emergency drainage system meant to reduce the volume of the lake. But to his great relief, the earthen dam holding back the water was intact. “It wasn’t a big avalanche,” Morales said. Lake Palcacocha is a mile long and 250 feet deep, and the effect of a large avalanche would be similar to dropping a bowling ball in a bathtub. Modeling scenarios predict a 100-foot wave so powerful it would blow out the dam. Three billion gallons of ice water would go roaring down the mountain toward the city of Huaraz, burying its 200,000 residents under an Andean tsunami of mud, trees and boulders. Lake Palcacocha is an example of the immediate threats Peru and other developing countries are facing from climate change. The country is especially vulnerable since it is home to 70 percent of the world’s “tropical glaciers” — small, high-altitude ice caps found at the earth’s middle latitudes. Their disappearance has made Peru something of a laboratory for human adaptation to climate change. So far, it’s not going very well. In the weeks since President Trump announced the United States would renege on its commitment to the Paris climate accord, scientists have pointed to new signs the planet is edging closer to a precipice. Maximum temperature records continue falling. New cracks are opening at the polar ice caps. Peru’s high-altitude glaciers are tiny by comparison, but millions of people depend on their runoff for water, food and hydroelectricity. “We have glaciers across 19 — no, 18 — mountain ranges,” said Marco Zapata, a top scientist at Peru’s institute for glacier research, correcting himself to reflect the latest monitoring data. For Peruvian authorities, this is becoming more of an engineering problem than an environmental lament. Without reliable glacial runoff, the country’s water and irrigation systems will need to be retooled. New dams and reservoirs will be needed to more effectively store water. Investments in agriculture and other water-intensive industries will need to be recalculated. YUKON DELTA NATIONAL WILDLIFE REFUGE, Alaska — The Arctic is warming about twice as fast as other parts of the planet, and even here in sub-Arctic Alaska the rate of warming is high. Sea ice and wildlife habitat are disappearing; higher sea levels threaten coastal native villages. Starting just a few feet below the surface and extending tens or even hundreds of feet down, it contains vast amounts of carbon in organic matter — plants that took carbon dioxide from the atmosphere centuries ago, died and froze before they could decompose. Worldwide, permafrost is thought to contain about twice as much carbon as is currently in the atmosphere. Once this ancient organic material thaws, microbes convert some of it to carbon dioxide and methane, which can flow into the atmosphere and cause even more warming. Scientists have estimated that the process of permafrost thawing could contribute as much as 1.7 degrees Fahrenheit to global warming over the next several centuries, independent of what society does to reduce emissions from burning fossil fuels and other activities. This year, Dutch commuters ditched fossil fuels to power their country's trains on 100% wind energy - and it's a grand idea that's catching on the world over. As climate change brings high temperatures around the globe, new research suggests some airplanes could struggle to takeoff. Airplane wings generate less lift in thin air. Warmer air is thinner air, as molecules in the atmosphere move farther apart as they heat up. Thus, during extremely hot portions of the day, some plane models may need to dump weight -- whether fuel, cargo or passengers -- to get airborne. AoA! I am posting something seen on the Internet (Googal Scholar 2 b prejise): Please beat up on this as much as possible. Our concept studies indicate that a set of reflectors floated in the upper atmosphere can efficiently reduce radiant forcing into the atmosphere. The cost of reducing the radiant forcing sufficiently to reverse the current rate of Global Warming, is well within reach of global financial resources. This paper summarizes the overall concept and focuses on one of the reflector concepts, the Flying Carpet. The basic element of this reflector array is a rigidized reflector sheet towed behind and above a solar-powered, distributed electric-propelled flying wing. The vehicle rises above 30,480 m (100,000 ft) in the daytime by solar power. At night, the very low wing loading of the sheets enables the system to stay well above the controlled airspace ceiling of 18,288 m (60,000 ft). The concept study results are summarized before going into technical issues in implementation. Flag instability is studied in initial wind tunnel experiments. This has forced evolution of the concept to one similar to a hang-glider, the sheet supporting the propelled wing at very low flight speed. Later designs may dispense with the wing altogether. Lift-induced drag can be minimized by joining several elements together in flight to create a large aspect ratio, and by staggering elements in flight as long-distance birds do, with swarm flight control. The primary parameter is the areal density that can be achieved for the reflector sheet under aerodynamic loads. Successful designs can be closed even with 2-mil Mylar sheets, but going to strengthened versions of solar sails would offer strong advantages. Mass-based cost estimation allows an upper bound on architecture cost by comparing equivalent number of launch masses of a well-known large space launch system. The next level of cost analysis shows that the manufacturing cost which is dominant, is best addressed through automotive industry techniques. Freeman Dyson claimed that climate change is the secular religion of the 21st century. Not counting that in Lok Sabha, the Capitol, British Parliament etc. How come the city that elected a President, Chicago, the Windy City, did not make that list? I would have thought that going by the above, a large proportion of Sri Lankan population too would be vulnerable to rising seas levels. But Sri Lanka is missing from the list. 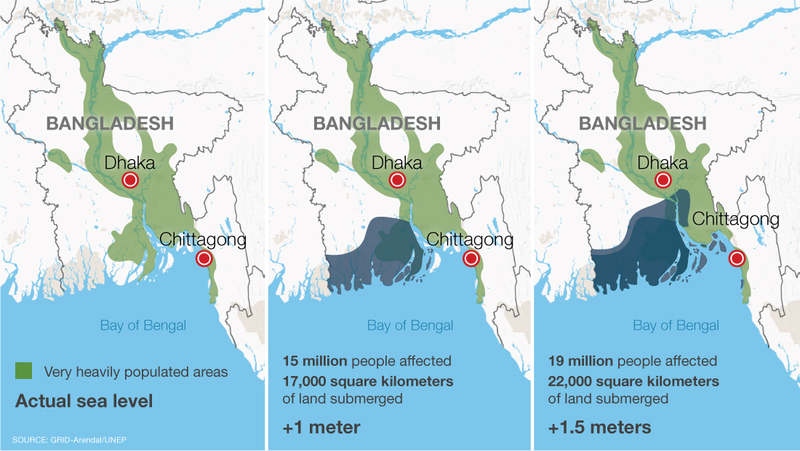 Kashi wrote: I would have thought that going by the above, a large proportion of Sri Lankan population too would be vulnerable to rising seas levels. But Sri Lanka is missing from the list. 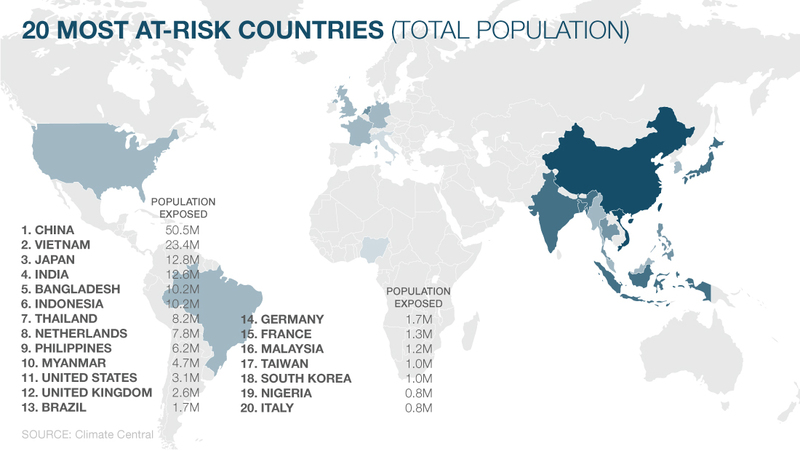 Most of the above figures and numbers are for "number of people affected" and it correlates with population density given that India and china are in the top three. Are there similar numbers for top 20 states affected in terms of loss of land area due to rising seas? I would not be surprised if all the countries creating a racket about global warming in Europe are the most affected if we looked at those numbers. I cannot find any such figures with a web search. Mort Walker wrote: Freeman Dyson claimed that climate change is the secular religion of the 21st century. It is interesting to see number of times Dyson's name taken in this way. Some may find my earlier post in this dhaga helpful. Amber G. wrote: It was interesting to see my guru Freeman D. described as "greatest living scientist"
It was amusing to see the invoking of Freeman Dyson as "one of the greatest living scientist" in this way. This is being done not only in brf but many other places by others too. It was also amusing to see that NONE of these Republicans hopefuls, (and "pretty famous guys" like Glen Beck) quotes FD's current take on Iran Nuclear Deal (which he supports in very strong terms), or his theories of cosmology which does NOT talk about earth being created in 7 days. As most of those who have worked with (or know about him) know, FD is very well-known "contrarian"..
(His wife, at least sometimes ago, believed in GW a lot , wanted to buy Prius, and he did not think it will save the earth One should be careful in understanding what he says..and not to use his words in 30 seconds sound-bytes. He is quite dismissive of Al Gore, and Al Gore's movie (Inconvenient Truth), and even of James Hansen (head of the NASA Goddard Institute - who I think was an adviser to Gore' film)... Legend has it that when the Dyson couple saw the Gore's movie, Mrs Dyson cried seeing all the ice melting .. and confronted her husband "Everything you told me is wrong!" to that her husband replied "polar bears will be fine"
Anyway just to give some perspective -- TIFWIW (read more yourself - there is plenty good material out there). - He makes quite a bit of distinction between pollution (which is "clearly" man made, its effects much precisely predicted and can be controlled by easier methods) CO2. Anyway there is plenty of good material out there to discus and read while avoiding CT's and pseudoscience..
With the increase in CO2 the earth is getting greener - that is what NASA detected. That is true. However, there is data to prove otherwise too, which very unfortunately is not considered in most discussions by some eminent scientists. One of the most profound effects of a warming world is underway on US soil – the impact will force thousands to relocate, and have far-reaching, global consequences. Sara Goudarzi reports from Alaska. Vladimir Romanovsky walks through the dense black spruce forest with ease. Not once does he stop or slow down to balance himself on the cushy moss beneath his feet insulating the permafrost. It’s a warm day in July, and the scientist is looking for a box that he and his team have installed on the ground. It’s hidden nearly six miles (10km) north of the Geophysical Institute at the University of Alaska in Fairbanks, where he’s a professor of geophysics and heads the Permafrost Laboratory. The box, which is covered by tree branches, contains a data collector connected to a thermometer installed below ground for measuring permafrost temperature at different depths. Permafrost is any earth material that remains at or below 0C (32F) for at least two consecutive years. Romanovsky connects his laptop to the data collector to transfer the temperature data for this location – called Goldstream III – which he will later add to an online database accessible to both scientists and interested individuals. “Permafrost is defined on the basis of temperature, the parameter that characterises its stability,” Romanovsky says. When the temperature of permafrost is below 0C (32F), for example -6C (21F), it is considered stable and will take a long time to thaw or to change. If it's close to 0C, however, it's considered vulnerable. Every summer the portion of soil overlaying the permafrost, called the active layer, thaws, before refreezing the following winter. At Goldstream III, on this July day, the summer thaw currently ends at 50cm depth. As the Earth warms and summer temperatures climb, the thaw is deepening and expanding, causing the permafrost underneath to become less stable. The consequences, if this thawing continues, will be profound, for Alaska – and for the world. Nearly 90% of the state is covered in permafrost, which means entire villages will need to be relocated, as the foundations of buildings and roads crumble. And if this frozen cache releases the millennia of accumulated carbon it has locked within, it could accelerate the warming of our planet – far beyond our ability to control it. As permafrost thaws, houses, roads, airports and other infrastructure built on the frozen ground can crack and even collapse. Long article. Worth the read. Here is real data for anyone to consider. Climate change could lead to sea level rises that are larger, and happen more rapidly, than previously thought, according to a trio of new studies that reflect mounting concerns about the stability of polar ice. In one case, the research suggests that previous high end projections for sea level rise by the year 2100 — a little over three feet — could be too low, substituting numbers as high as six feet at the extreme if the world continues to burn large volumes of fossil fuels throughout the century. “We have the potential to have much more sea level rise under high emissions scenarios,” said Alexander Nauels, a researcher at the University of Melbourne in Australia who led one of the three studies. His work, co-authored with researchers at institutions in Austria, Switzerland, and Germany, was published Thursday in Environmental Research Letters. The results comprise both novel scientific observations — based on high resolution seafloor imaging techniques that give a new window on past sea level events — and new modeling techniques based on a better understanding of Antarctic ice. The observational results, from Texas and Antarctica, examine a similar time period — the close of the last Ice Age a little over 10,000 years ago, when seas are believed to have risen very rapidly at times, as northern hemisphere ice sheets collapsed. Off the Texas coast, this would have inundated ancient coral reefs. Usually, these reefs can grow upward to keep pace with sea level rise, but there’s a limit — one observed by a team of scientists aboard a vessel called the Falcor in 200 foot deep waters off the coast of Corpus Christi. “Over 120 kilometers, the reefs behaved the same way. It’s difficult to find any other reason why they would do this,” Droxler said. Droxler thinks the reef structures suggest eras when sea level was rising by tens of millimeters annually, far beyond the current, roughly 3 millimeters per year. (A 50 millimeter annual sea level rise would produce a meter, or over 3 feet, of rise every 20 years.) The new study therefore concludes that during the last ice age, there were multiple bursts of fast sea level rise — and implies that our future could hold something similar. “The steady and gradual sea-level rise, observed over the past two centuries [may] not be a complete characterization of how sea level would rise in the future,” the study concludes. Original article from Jan, 2017. 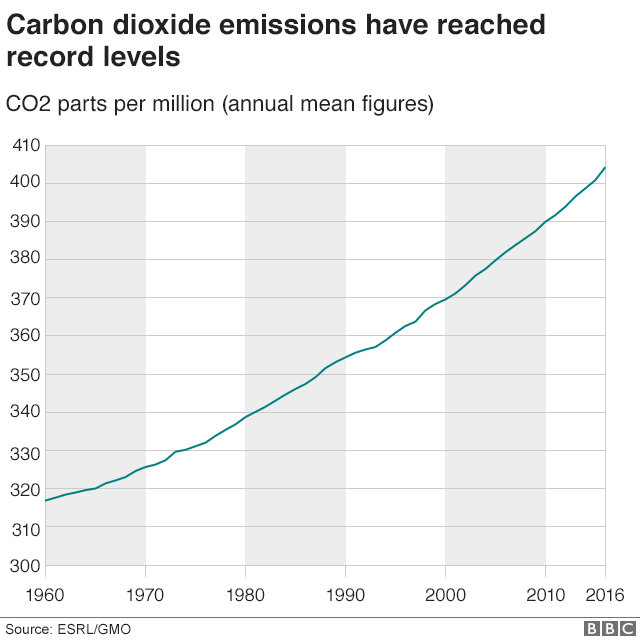 Concentrations of CO2 in the Earth's atmosphere surged to a record high in 2016, according to the World Meteorological Organization (WMO). Last year's increase was 50% higher than the average of the past 10 years. Researchers say a combination of human activities and the El Niño weather phenomenon drove CO2 to a level not seen in 800,000 years. 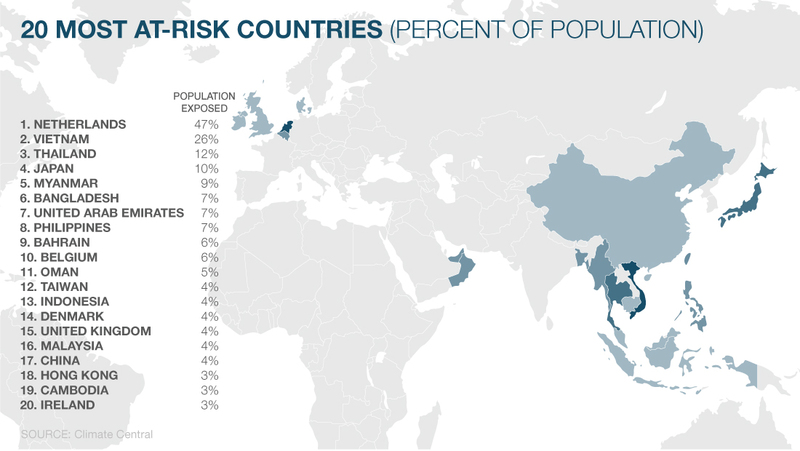 Scientists say this risks making global temperature targets largely unattainable. This year's greenhouse gas bulletin produced by the WMO is based on measurements taken in 51 countries. Research stations dotted around the globe measure concentrations of warming gases including carbon dioxide, methane and nitrous oxide. DENVER — Imagine planning your next trip and finding that Delta was selling first-class seats for less than the cramped middle seats in the back of the plane. So you fly first class to New York and walk into the best French restaurant, only to discover that every dish is cheaper than the burger and fries down the street. Waiter, bring the duck à l’orange! Fanciful as that might sound, something a bit like it is happening right now in the world of electricity. Xcel Energy is a utility company with millions of electric customers in the middle of the country, from Texas to Michigan. In booming Colorado, the company asked for proposals to construct big power plants using wind turbines and solar panels. The bids have come in so low that the company will be able to build and operate the new plants for less money than it would have to pay just to keep running its old, coal-burning power plants. You read that right: In parts of the country, wind and solar plants built from scratch now offer the cheapest power available, even counting old coal, which was long seen as unbeatable. Xcel, Colorado’s biggest power company, has pitched a plan to regulators that will involve replacing two large coal-burning units with renewable energy and possibly some natural gas. The company expects to save tens of millions of dollars as a result. Power bills in Colorado have been falling recently, and they are likely to fall further with this plan. So the plan will be cheaper, but why will it be better? Because it will cut Xcel’s emissions. That includes the carbon dioxide that is warming the planet, of course, but it also includes other pollutants, like the fine particles that can send children to the hospital with asthma attacks. But the most striking feature of this early age of mammals is that it was almost unbelievably hot, so hot that around 50 million years ago there were crocodiles, palm trees, and sand tiger sharks in the Arctic Circle. On the other side of the blue-green orb, in waters that today would surround Antarctica, sea-surface temperatures might have topped an unthinkable 86 degrees Fahrenheit, with near-tropical forests on Antarctica itself. There were perhaps even sprawling, febrile dead zones spanning the tropics, too hot even for animal or plant life of any sort. This is what you get in an ancient atmosphere with around 1,000 parts per million (ppm) of carbon dioxide. If this number sounds familiar, 1,000 ppm of CO2 is around what humanity is on pace to reach by the end of this century. That should be mildly concerning. Naafs’ team studied examples of lower-quality coals called lignites, or fossilized peat. They had been collected around the world (everywhere from open-pit coal mines in Germany to outcrops in New Zealand), and spanned the late-Paleocene and early-Eocene epochs, from around 56 to 48 million years ago. They were able to reverse engineer the ancient climate by analyzing temperature-sensitive structures of lipids produced by fossil bacteria and archaea living in these bygone wetlands, and preserved for all time in the coal. The team found that, under this past regime of high CO2, in the ancient U.K., Germany, and New Zealand, life endured mean annual temperatures of 23–29 degrees Celsius (73–84 degrees Fahrenheit) or 10–15 degrees Celsius (18–27 degrees Fahrenheit) warmer than modern times. But closer to the equator in this global sweat lodge, the heat might have been even more outrageous, shattering the limits of complex life. To see exactly how hot, Naafs’ team also analyzed ancient lignite samples from India, which would have been in the tropics at the time—that subcontinent still drifting across the Indian Ocean toward its eventual mountain-raising rendezvous with Asia. But unfortunately, the temperatures from these samples were maxed out. That is, they were too hot for his team to measure by the new methods they had developed. So it remains an open question just how infernal the tropics became in these early days of our ancestors, but some computers tasked with recreating this planet spit out the stuff of science fiction. I think we are meddling with nature and it is stupidity. Have you seen those khaki-clad instant biologist trying to feed (forcefully) mineral rich milk to baby elephants or dolphins. So called "scientists " (alway blond beautiful girl with some white dude) sailing in protected coral areas to study the effects of rising sea temperatures. There are other do-gooders covering glaciers with Al foils to stop melting. Problem is that we have made ourselves comfortable in our environment and landscape. We do not want any change. We are agitated when we see change. We have made towns on ancient riverbeds. We made cities on geo-logical fault-lines. We cleared forests. We messed-up with nature big time. Earth is a closed system. It relieves radiation from sun. That radiation is not same everyday or year because of Sun-cycles. Just think over it. We are not producing more CO2 , we are just changing its position. CO2 fixed as Hydrocarbon. We release it in atmosphere. It will be eventually fixed again into Hydrocabons. Green house model has inherent flaw (IMO). It discount the water cycle. Fear-monger do gooders are crying about how earth is turning into Venus. It is all BS. rsingh wrote: I think we are meddling with nature and it is stupidity. Have you seen those khaki-clad instant biologist trying to feed (forcefully) mineral rich milk to baby elephants or dolphins. So called "scientists " (alway blond beautiful girl with some white dude) sailing in protected coral areas to study the effects of rising sea temperatures. There are other do-gooders covering glaciers with Al foils to stop melting. There is a bit of hysteria in all this. With more efficient technology, fusion, thorium battery, renewables, reforestation/afforestation, etc. humanity will get through this CO2 problem. If the sea-level rises, is there anything fundamentally wrong with living on boats I wonder. And eating seaweed and fish. Lunch on Korean airlines is sea-weed, and is very nutritious as well as tasty, if you use the toothpaste-tube with the hot sauce. Home construction codes would have to be revised to insist on floating foundations. Malloostan KSRTC buses now used as springboards for ppl taking diving lessions, will need a hovercraft mode. But Mobile Homes have been in use for ages. So have floating homes, in Thailand and Myanmar and maybe Dal Lake. Corporate HQ may be 10 floors deep - starting with the visible 2-story structure above the waterline. Commuters will either zoom in via speeboat, or on nice days, water-ski. No more sitting in traffic. Engines may emit CO2, but most of it under the water surface. No more fear of earthquakes or mudslides or forest fires. Tsunamis, yeah, but they are OK if you are far from land. Suddenly your "coastline" that defines where your people live, can be 10 or 100 miles out from present lines. Agriculture can also extend that far. Maybe the whole Pacific Ocean Plastic Garbage Dump will be turned into a mega crop field. Indonesia and Lakshadweep become continents. Last edited by UlanBatori on 12 Aug 2018 02:07, edited 1 time in total. What is the point of the above conference? "Participation limited to 30 attendees!" Huh?? The effort of making that brochure listing the Vice Chancellor and the Patron etc is more than the net bijnej generated. What am I missing, hain? Western nation's have squandered a ton of money and are now sitting on large unpayable promises to their citizens. Enter carbon tax , carbon trading racket to skim money out of people's pockets. It's bad as it promotes the creation of rent seeking middlemen who produce nothing but who's entire likelyhood comes to depend on milking the earnings of productive society. Not a good situation as the science of studying climate is turned into a joke to support the money skimming. Neshant wrote: Western nation's have squandered a ton of money and are now sitting on large unpayable promises to their citizens. It's real man but the West is going to have to take the lead role in reducing emissions. Technology will help us get over it. There was one argument on npr I was listening while on the road, this guy rejects the idea that more forests for reduced CO2. he says, the data shows otherwise. I am not in agreement here.